We are currently fostering a dog through Cedar Valley Pit Bull Rescue and he is looking for a good home! Tanner is a warm, goofy, tender guy who needs a home with someone willing to show him, at his pace, that the world is safe and fun. He was hit by a car on July 4th, on the run after panicking at fireworks. His left femur was shattered. Cedar Valley Pit Bull Rescue took him on, and Critter Crusaders of Cedar Rapids funded the surgery to save his leg. He spent a couple months in rehab in a quiet home in West Branch, where he lived around 9 cats and a senior female dog. 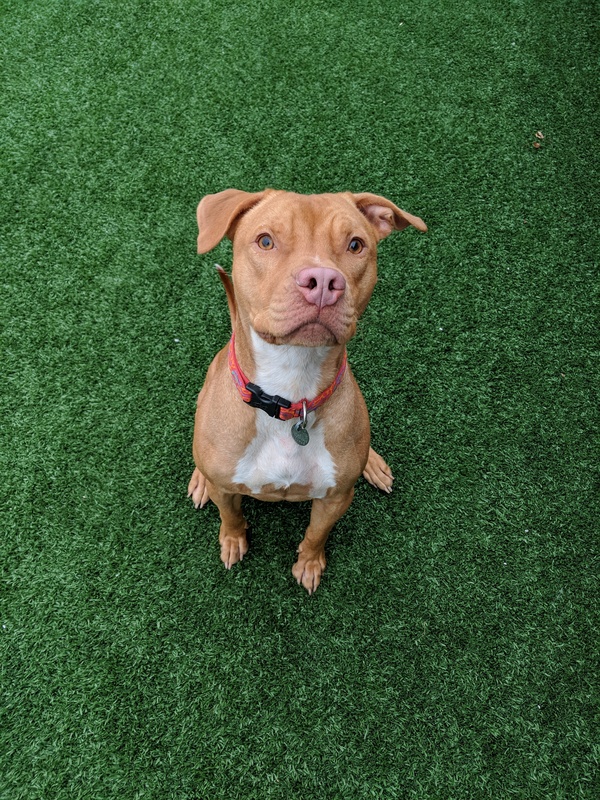 He has been with Two Sisters Kennels since November and he’s ready to graduate to his forever home where he has greater opportunity to interact and bond. Tanner is around 1 y.o., weighs 60lbs, and is altered and vaccinated. SPECIAL NEED: He has anxiety about new sights and sounds; out on a walk, he prefers to stay within view of his house. If he hears or sees something that wigs him out, he tucks his tail, digs in his heels, and wants to bolt for home. So, a HARNESS is necessary. PATIENCE necessary. He’s well worth the effort and has the potential to be a wonderful companion.